Prada and I got off to a rocky start. When I first tested Prada Amber (sometimes referred to only as Prada) I overapplied it and was frankly overwhelmed by the dense, dark, wine-like fruity opening. It's not quite the scent of wine, because it is much less sweet. But I'd say that it does come rather close to wine dregs. Suffice it to say that the opening is very intense. 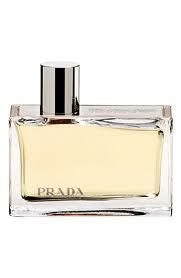 My first encounter with Prada Amber was through a decant sent to me by a fellow fragrant traveler in New York City. Since she is a woman who in my estimation has excellent taste, I suspected that my problem with this perfume had something to do with me. With time, I realized that I needed to give Prada Amber another chance, and I am very glad that I did. I now regard this as a fine fruity amber perfume with a great deal of depth and complexity and a gorgeous labdanum drydown. There is much, much more labdanum here than vanillin, so much so that it actually smells to me closer to a straight-up labdanum than an amber perfume. Unlike many amber perfumes, in Prada the vanilla is not even detectable to my nose as an isolable note. The labdanum is central to this composition, and the patchouli is fairly strong as well, but again this is not a part of the post-Angel sweet patchouli pack at all. Prada Amber is unique. I ended up liking this creation enough to eventually pick up a 50ml bottle, and I continue to pine for one of the stunning atomizer models. It's only a matter of time before I find one at what seems like an unbeatable price, at which point I'm sure that I'll snap it up. The Prada aesthetic is top notch when it comes to packaging. Fortunately the perfumes smell very good, too! Prada Amber was selected along with eleven other perfumes by Chandler "Contingency Plan Man" Burr to be included in the “Art of Scent” exhibit currently being held at the Museum of Arts and Design. On the other hand, Prada Amber was not so favorably received by the authors of The Holey [sic] Book, who appear to hate the house of Prada and every perfume they ever produced. I applaud Burr for having the guts to float as masterpieces of olfactory art a number of perfumes derisively dismissed by Turin & Sanchez as failures. Prada obviously does not jive with the Royal[ties] Coup[le]'s taste, above all their hatred of clean scents (Dolce & Gabbana Light Blue garnered all of one star!) and all things amber. Since everything from this house is either ambery or has a decidedly clean demeanor, it did not fare well. Burr has done much to resurrect the image of Prada as a purveyor of fine perfume, and I do not believe that it has been only a result of the fact that Puig is one of his major funders. Though I'm also quite certain that it didn't hurt. What Burr's radical disagreement with the other two self-appointed "experts" shows, it seems to me, is that in fact, when it comes to olfaction, beauty does indeed lie in the nose of the sniffer! According to me, Prada has produced some excellent creations, and Prada Amber for her is certainly one of them, although it is not an easy perfume to wrap one's nose around, as it defies most of the usual categories. The quality of the materials is beyond dispute, and there certainly could be much worse things than increasing the global sales of this perfume through proclaiming it to be a masterpiece of olfactory art. It's a good perfume, no doubt, but labeling it a work of neo-romanticism may be stretching things a bit. Did the perfumers, Carlos Benaïm, Max Gavarry, and Clément Gavarry, and the house conceive of this perfume as anything more than a perfume when they launched it back in 2004? Of course not. Why we should appropriate the language of visual art for ephemeral scents is far from obvious to me. Seems like a fairly clear case of gratuitous obfuscation or obscurum per obscurius (yes, that's a self-referential expression...). But that's a another story. The bottom line here, again, is that Prada Amber is a fine and original dark and fruity (not sweet!) oriental perfume. Prada Amber pour homme is complicated. Somehow it manages to combine the Prada house affinity for both amber and cleanness in the very same creation. In fact, reading the note hierarchy given at Parfumo.net (bergamot, cardamom, mandarin, patchouli, tonka bean, vanilla, neroli, saffron, vetiver, and suede), it's not at all obvious what one is in for. Résine de Labdanum de France, Feuilles de Patchouli d'Indonésie, Cardamome du Guatemala, Safran d'Espagne et Daim. Back to the composition: on the bottle there is no mention of vanilla or tonka bean, or mandarin or vetiver. The first two omissions make sense, since this is not really a sweet perfume at all, although its amber facet is undeniable. Like the made-for-women Prada Amber, Prada Amber pour homme showcases labdanum, not sweet vanillin. But wait, there's more. Prada Amber pour homme also features a soapy facet very similar to that of Prada Infusion d'Homme (a name which clearly reveals why Italians should stick with their native language in marketing perfumes!). All of this may sound like something of mess, but somehow it's not. It works for me, and although on occasion the soap wafts sharply, the up-close, nose-to-skin experience is really splendid. In some ways I feel as though this work is a good example of how a creation can have a surface (superficial) appearance which may appeal to one type of perceiver, and a deeper more interesting personality which others may choose to penetrate. Think of a best-selling novel which has a hidden, cryptic interpretation invisible to most readers but recognizable by a few who make the effort needed to break through. In order to fully appreciate this fine and complex creation, I find that I have to really concentrate on it, and it's a great scent to wear to bed and dose off dreaming about. The smooth suede and saffron are much more marked on the skin than is the volatile soap note, which is what most people in the environs are going to take away from the wearer of Prada Amber pour homme. That is also why smelling this creation on a paper strip will be completely misleading. Anyone who wears this creation is going to waft at least vaguely of expensive soap. There could be much worse things, of course, than having people think that you smell like expensive soap! I understand the naysayers on this one. If one focuses only on the social distance experience of this fragrance, and if one is bothered by that slight sharpness of the soap, then Prada Amber pour homme could, depending on the person, end up as a scrubber. I would say that Prada Infusion d'Homme is a good litmus test for whether Prada Amber pour homme is going to work for a prospective wearer. The soap note is very similar, but Amber pour homme is much, much more complex and offers a unique take on amber because although the notes are rather oriental, the final composition, with its marked soapiness, somehow evades categorization. I like this a lot and am happy to own a bottle of this Daniela Andrier creation, which fits right in with the Prada Infusion series, while being entirely distinct. This is a tough choice for me. I own both Prada Amber and Prada Amber pour homme, so obviously I like both of these perfumes—and, yes, I do consider the made-for-men creation to be just as much a bona fide perfume as its namesake is—it's not just a hum-drum flanker. In fact, it's not a flanker at all: it's a completely different perfume. What's funny in this case is that although the same name is being used for the two perfumes, their only link is the labdanum connection. Well, and the bottles, which complement one another quite nicely. I really love the meticulously designed vessels in which all Prada perfumes are housed, and these ones are especially sleek, not only the smooth variably thick glass, but also the attractive metal plates affixed on the top or the side. 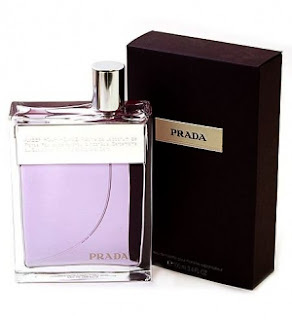 Now that we've broached the question of visuals—which do matter, in my opinion—I should add that the bluish purple color of Prada Amber pour homme is also very appealing and indeed fitting, given the cool demeanor of the fragrance. I am happy to be able to report that the liquid has not during the year since I acquired it turned gray or brown, as is usually the case in my experience with blue and purple perfumes. The box is equally beautiful: a textured dark purple with a cloth-like lamination and the name Prada on a sewn-on cloth label. Prada gets 100% for packaging on all of its fragrances. A+ is my grade. 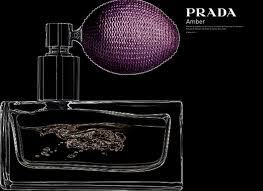 Obviously, I do not consider the Prada Amber choice to be between Charybdis and Scylla, but if I were forced to choose between the made-for-men and made-for women version, I think that I would go with Prada Amber for her. Why? 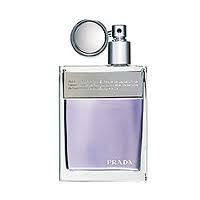 Only because Prada Infusion d'Homme overlaps in its manifest soapiness with Prada Amber pour homme. Prada Amber for her, in contrast, is entirely distinct from anything else launched by this house. Which makes a lot of sense, of course, since Daniela Andrier has been the nose for nearly everything but Prada Amber (created by Carlos Benaïm, Max Gavarry, and Clément Gavarry). So, in the end, if forced to choose, for variety's sake, I'd take Prada Amber for her, which, incidentally, I do believe also to be unisex. Hers gets my vote today.